Garden gnomes are typically a peaceful and happy group. They spend most of their time standing around in your garden smiling and sitting on toadstools. Their peaceful existence is about to come to an end thanks to a zombie infection that has spread to their community. 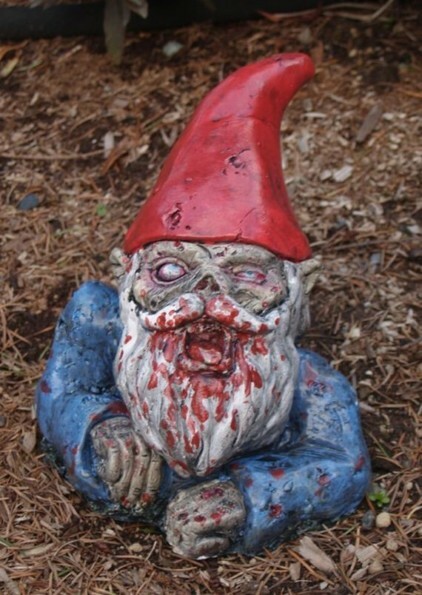 This Zombie Garden Gnome has clawed his way out of the ground to wreak havoc on an unsuspecting group of happy garden gnomes. His thirst for brains knows no bounds, and he’ll stop at nothing to chew his way though those pointy hats, and into the brains of other garden gnomes. okay here it is….Gnorman from The Dark Garden Inc. physical specifications are impressive at 20″ tall and 14″ wide, he can and will tear into the kneecaps of adolescents…..Gnorman made of solid cold form resin weighing 14 pounds and he can be used to bludgeon even the most vigilant of door to door solicitors..that means you Mr. Kirby…our Gnombie is ready for any environment with his individually hand painted exterior utilizing an all weather paint and a outer layer protectant that aids in providing an additional level of protection from the elements, but not from late night poachers…we are vigilant in our protection of our little friend as you should be…..and it should go without saying, in addition to their physical specifications……these are 100% evil….so need not worry about Gnorman as you can be rest assured it is those without, who should be concerned about a late night brain feast…….